While Futurism was mainly a phenomenon associated with its core advocate’s homeland, the boot-shaped shores of Italy weren’t the sole dwelling place of this art movement. In fact, prior to Fortunato Depero eliciting “Futurist Toys” in his 1915 manifesto (read more here), a Londoner was already experimenting with and exhibiting decorative sculptural works along these lines. While not toys in the truest sense, these Futurist Cat ceramic pieces were imaginative shapes adorned with brightly colored markings, their aesthetic reminiscent of some concepts that would become associated with the designer toy movement over eight decades later. And the artist behind these was none other than Louis Wain. In 1880, a 20-year-old Louis Wain was left with the huge responsibility of providing for his mother and five younger sisters after the death of his father. Turning to his passion for art, Wain began creating illustrations for several journals, mainly enlisted to depict country scenery. Early in 1884, Wain married the family’s governess, Emily Mary Richardson, who was ten years his senior, though shortly after being wed she tragically started showing symptoms of breast cancer. To amuse Richardson during her illness, Wain extensively sketched the antics of their black and white kitten, Peter. Encouraged by his ailing wife to publish these works, Wain’s first drawing of anthropomorphized cats was published in the Christmas issue of The Illustrated London News in 1886. Titled “A Kittens’ Christmas Party”, the illustration depicted 150 cats, many of which resembled Peter, engaged in sending invitations, playing games, and making speeches. And though Wain had found the subject that his artistry would forever become associated with, his wife wouldn’t survive past the following year. Long before people were amused by the human-like attitudes and antics of Heathcliff and Garfield, Wain found widespread success with his cat depictions. Over the next thirty years of his career, he illustrated about one hundred children’s books, and his work appeared in papers, journals, and magazines, with his images being regularly reproduced on postcards. By 1914, the popularity of this direction wasn’t showing sign of subsiding, and Wain had reportedly drawn over 600,000 cats by his own count. But this would also be the year that Wain introduced felines without the remotest resemblance to those 600,000 cats he has drawn before; the cozy and comfortable look of his traditional cats replaced by geometrically expressive Futurist Cats. According to the invitation sent out for Wain’s debut exhibition of his Futurist animal sculptures, viewers should bring “your smile with you, for good luck awaits when you see us!” And for those that attended the June 12th, 1914 opening at the Shoe Lane premises in London, around twenty different Futurist animal shapes were perched upon “twisted chairs and crooked pedestals”, as an article in The Star at the time described. Given titles like “Sphinx Cat, the Mascot Cat, the Master Cat, the Mystic Cat, the Good Luck Cat, and the Road Hog Cat“, as The Star article further notes, there were also “Lucky Pigs and Lucky Bulldogs [included] for variety”. Having been in the works for several years, with the model and design for at least one of these pieces known from a drawing by Wain in 1912, the sculptural productions were handled by a pottery factory in Turn-Teplitz, Bohemia Austria by the name of Riessner, Stellmacher & Kessel, whose “Amphora” mark can be seen underneath the pieces alongside that of London’s own Max Emanuel and Co. According to some reports, these were not well received in the United Kingdom at the time but there was a demand for them in the United States, leading Wain to send a large consignment of these ceramic works across the Atlantic by boat, which supposedly was sunk by a German U-boat’s torpedo. Regardless of the validity of that tale, it is known that Wain did have more of his Futurist animal sculptures cast in the aftermath of the Great War, specifically from circa 1919 until 1922. The Riessner, Stellmacher & Kessel factory was once again used for the task, post-war borders now having them hail from Trnovany, Czech Republic, and the English importer to receive them is thought to be a company named Fireside, based on a stamp some have noted on the bottom of pieces from around this time. Erroneously called Cubist Cats by some, most likely due to their geometric forms, these Futurist animal pieces were decidedly influenced by the art movement they were named after. And though some of them were capable of holding flowers like a vase, Wain referred to them collectively as mascot figurines, each decorated with imaginative characters that were meant to be “Meow meow notes”, as the artist explained to the reporter from The Star. Some have proposed this direction was an early indicator of Wain’s failing mental health, but it was over a decade after these pieces’ conception that he was institutionalized. Regardless of what the impetus might’ve been, what the viewer is presented with is Wain’s anthropomorphic cats reimagined in a fantastical manner, their strange shape meant to bring delight, their classical construction meant to evoke nostalgia. 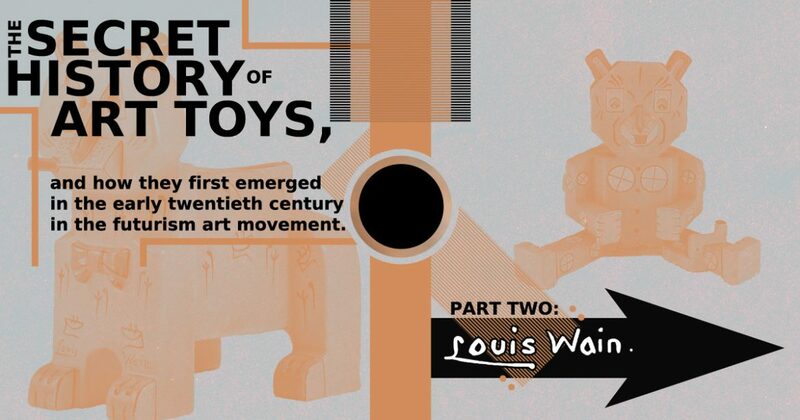 Or, put more simply, an obvious forefather to the designer toy art movement. Nick - Very nice article. I have written a small book on the Futurist Mascot Cats of Louis Wain. I am also a collector and have 15 of the cats. The Futurist toys with the Wain stuff is wnderful. Back in the late 60's I communicated the relative of Luigi Russolo. I got some good info on his intonarumori. ANy how - great piece - thanks for it.